It is ironic that more people around the world have heard about Enya rather than her family band Clannad which has been around since the seventies. Maybe it is the aggressive album promotion drive which has increased her profile in recent years. It was thus the promotion of her latest album, Shepherd Moons which brought her to Singapore recently. Accompanying the diminutive composer was her producer, Nick Ryan who also played out the role of minder during the interview. When she was playing keyboards for Clannad in the early eighties, she stuck to her Gaelic name of Eithne Ní Bhraonáin. This was then shortened to Enya (the phonetic translation of her first name) at the start of her solo musical career. So why did she leave Clannad? "I was only with them because they were my family. I wanted to do something musically different to what they did. In '82, I started to compose my own music," she says in her unmistakably Irish accent. Her first project was David Puttnam's The Frog Prince soundtrack. However, she was quick to put it in perspective. "It was never done the way that we wanted it to be. It was a good start career-wise but musically, we didn't get to arrange the music, so it was a bit disappointing. As it was my first project, at least it served the purpose of letting people know that I compose music. It was more a foot in the door." In 1986, she composed the haunting soundtrack for the BBC documentary, The Celts. And yet, after all these projects, many sections - her record label's official Enya biodata included - list Shepherd Moons as only Enya's second solo album. A bit confusing to say the least, as Enya tries to explain. "It's officially the second solo but for me, it's the third album because The Celts was very important. But it was still dictated to us and we had to write particular themes - so that's why people consider Watermark the first solo album because it was the first one we didn't have to work to a soundtrack or visual." So where does The Frog Prince stand and is it even available now? To which Nicky Ryan replies: "No, it's not available now. We bought it all up." Which sums up their feelings about it. In keeping with her ethereal image, the new album is aptly named Shepherd Moons, the origin of which Enya explains, "It's the title track and is an instrumental. The idea came from Roma (lyricist and wife of Nicky). On the outer ring of Saturn, there are two little moons which protect and preserve the rings very much like a shepherd guiding his flock. I love the title because the association with the moon is quite romantic." As in her previous albums, the Irish influence is plainly evident in her music. "We were brought up speaking Gaelic as a first language in Donegal and Irish traditional music is very strong in this area. But as a teenager, I studied classical music and having been brought up as a Catholic, I sang a lot of church hymns in Latin and Gaelic. These have all combined to shape my music as it is now," she says. It is rather surprising that her albums which feature such an obscure language as Gaelic should have gained such widespread popularity. This attests to the fact that Enya's strength lies in writing lush melodies which transcend language barriers. As she says, "The melody is the most important part. Only after I've got what I wanted will I work around it." Nowadays, much of an artist's worth is dependent on translating the album output onto stage. Enya, whose album is very much a studio product, does not see herself performing live in promoting her new album. "It's not possible to take the music that is on the album and play it on stage like that but I would like to do an arrangement, more on the classical concert side using an orchestra, choir and synthesisers," she says. Shepherd Moons perpetuates the heavenly lilting sound that is instantly recognisable as Enya's domain. 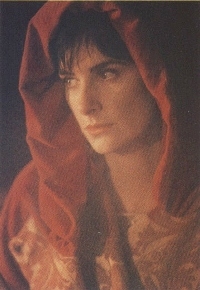 The product involves a multi-layering of Enya's vocals during the recording stage which gives rise to her characteristic 'cathedral sound'. And fittingly enough, her composition methods are just as unorthodox. She says, "I usually compose with my voice and sometimes accompany myself on the piano." As Ryan elaborates: "All the melodies are written by voice. The chord structures are already there - something Enya didn't actually realise until recently. She sings her melodies." Endowed with such an angelic voice, who's going to argue with her when she sings, How Can I Keep from Singing! Note: The transcript was done by the author and posted to alt.music.enya on 15 August 1996.